What is the Most Expensive Plant in the World? Saffron is a very expensive spice obtained from the flower of Crocus sativus. It’s harvested by hand and yields are really, really low. According to the reliable online source that is Wikipedia, “110,000–170,000 flowers or two football fields” are needed to produce one kilo. You can buy it online for around $100 for 20 grams. Having once known a friend of me Dad’s who feverishly collected orchids after retiring from life as a school headmaster, I know that orchid collectors can be a bit overboard with their affections for these delicate plants. Rare specimens are valuable, running into the thousands of dollars each. This is the catch-all for plants such as marijuana and opium poppies (cannabis sativa and papaver somniferum, respectively, for your inner botanist) from which you derive illegal drugs like pot and heroin. From these products, you can also derive lengthy prison sentences-plus the odd death sentence-in most countries in the world. OK, not exactly plants but they’re living things that grow in the ground. Mature palm trees can be really expensive, too, if you’re a successful Silicon Valley tech entrepreneur who needs to spruce up the entrance to his house. This was the scenario for an old boss who, in 2000, paid over $20,000 to buy and install two 35ft tall trees to bookend his house’s rather impressive entrance. Yes, the above are pricey but definitely not worthy of the “Most Expensive Plant in the World” title. The envelope, please. The title of the Most Expensive Plant in the World goes to the slender grasses that have membership in the Hordeum plant genus. They’re commonly called foxtails. On a per-gram basis, there is no plant in the world that will cost you so dearly. Here’s why. foxtails are not very friendly to man's best friend. luna prefers dog biscuits rather than these two foxtails that were removed from her nose. 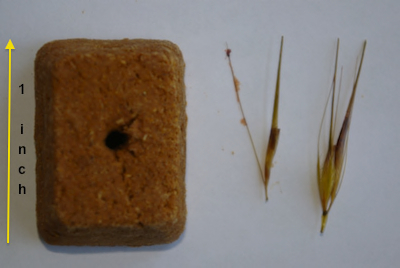 Last Saturday, two foxtail spikes weighing probably all of one gram total cost us $230. That’s the haul TGV earned for removing both from Luna’s nose. MW and OD took her to the local dog park in the early morning where she happily gamboled through the tall grasses. Somewhere between starting and stopping her celebrations, her big nose, acting like the General Electric GE90 engines that power Boeing’s 777 aircraft, hoovered up the foxtail pair from terra firma to the terra incognita deep within her schnoz. The sneezing started. Bleeding shortly followed. The blood then started spraying, flicking hither and yonder as great volumes of air entered and exited her nose, passing alongside the increasingly embedded foxtail barbs. It was a repeat of Luna’s encounters last summer with bees and wasps-rising panic followed by an expensive vet visit. Off to TGV, which, sadly, has yet to create a frequent buyer fidelity discount. After a morphine/dexdomitor sedation cocktail and six hours, the foxtails were gone as was the $230 from our checking account. In mid-afternoon, still doped up on the vestiges of the morphine, Luna lurched out of the vet’s office to recover at home, which she did because she’s a dog and that’s what young dogs do when they risk missing dinner; they recover as fast as possible so they can start eating again. Not even an encounter with the World’s Most Expensive Plant can deter Great Danes from doing what they do best, eating and prone recovery before the next meal. Make a Friend Laugh: share this today!